H&R Sway Bars are the perfect compliment to H&R Springs for W209/C209/A209, Coil Overs, Performance Shocks and Cup Kits. Designed to reduce body roll, increase lateral stiffness and improve handling, H&R Sway Bars are crafted from a special 50CrV4 spring steel that is both stronger and more resilient than competitive sway bars. H&R Sway Bars are bent on proprietary machines designed by H&R that seamlessly produce beautiful complex curves making H&R Sway Bars a perfect fit for your vehicle. All H&R Sway Bar kits have been shot peened and heat treated, and feature precision forged ends - many applications have multiple end link mounting points for adjustability. Also included are H&R exclusive bushings made from a Urethane / Teflon composite that eliminates squeaks, and don't require lubrication. Ever. That means no mess, no maintenance-just bolt in H&R Sway Bars and go! Like all H&R components, H&R Sway Bars are 100% made in Germany, and are powder coated for long lasting good looks and durability on the street and track. 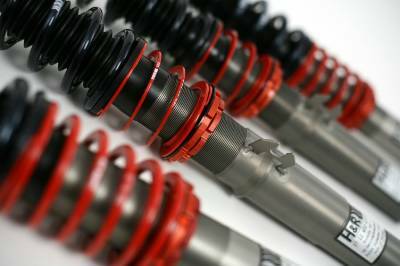 Suspension tuning doesn't stop with the springs and shocks. To really get your car dialed in, you'll want to look at a wide range of other components in your arsenal, including swaybars. Most modern performance-oriented vehicles now come stock with sway bars. The main purpose of a sway bar is to make the outside springs seem stiffer in a corner which is ideally what you'd want for the best performance. Swaybars are used to counterpart the lean and roll you experience from your springs. If you are seeking flatter cornering with less wallowing in the turns then you should definitely be considering sway bars as a crucial upgrade to your car's suspension components. Sway bars are also often available with adjustment holes in the end link mounting tabs, which prove to be a useful tool for dialing in the handling attitude of the car, from understeer to oversteer. The beauty of upgrading to stiffer sway bars is that they not only have a minimal impact on ride quality, but also they allow the use of softer springs so that a car can be set up for a cushier around-town ride and a flatter cornering attitude. Stiff springs and a very stiff sway bar can reduce body roll so much that the car's breakaway is hard to predict. Roll gives you some warning before you run out of grip. Most sway bars can be installed with basic hand tools.